Lawrence Lowe Hinshaw10 [Lawrence Loe Hinshaw4]. Hinshaw, Lawrence, head-of-household, age 22, born in North Carolina; parents born in North Carolina; owned home; farmer. Hinshaw, Maggie, wife, age 20 [unclear], born in North Carolina; parents born in North Carolina. Hinshaw, Francis, son, [..age unclear..], born in North Carolina; parents born in North Carolina. Hinshaw, L.L., head-of-household, age 32, born in North Carolina; parents born in North Carolina; first married at age 18; owned home ($3000 value); no radio in home; occupation: boarder, hoisery mill; not a veteran. Hinshaw, Maggie, wife, age 34, born in North Carolina; parents born in North Carolina; first married at age 20. Hinshaw, Francis, son, age 13, born in North Carolina; parents born in North Carolina; attended school. Hinshaw, Holt, son, age 8, born in North Carolina; parents born in North Carolina; attended school. Hinshaw, Leon, son, age 6, born in North Carolina; parents born in North Carolina. Wilson, S.B., boarder, age 55, born in North Carolina; parents born in North Carolina; married; occupation: teacher, public school; not a veteran. Hinshaw, Lowe [unclear], head-of-household, age 41, born in North Carolina; parents born in North Carolina; completed 7th grade; on Apr 1 1935 was living in the same house; rented home ($10/month rent); occupation: proprietor, retail grocery store. Hinshaw, Maggie, wife, age 42, born in North Carolina; completed 7th grade; on Apr 1 1935 was living in the same house. Hinshaw, Holt, son, age 18, born in North Carolina; completed 1 year of high school; on Apr 1 1935 was living in the same house; occupation: shuttle threader, silk mill. Hinshaw, Leon, son, age 16, born in North Carolina; completed 1 year of high school; on Apr 1 1935 was living in the same house; attended school. Hinshaw, Bobby, son, age 7, born in North Carolina; completed 1st grade; on Apr 1 1935 was living in the same house; attended school. Maggie's obituary was published in "The High Point Enterprise" (High Point, North Carolina) on Saturday, August 2, 197518 (see scan below). 1930 census, Asheboro Township, Randolph County, North Carolina; roll T626-1714, ED 5, page 9A, line #15, dwelling #165, family #174. RootsWeb WorldConnect data from Bill Wallace (). 1940 census, North Asheboro, Asheboro Township, Randolph County, North Carolina; roll T627-2961, ED 76-5, page 42B, line #55, household #259. 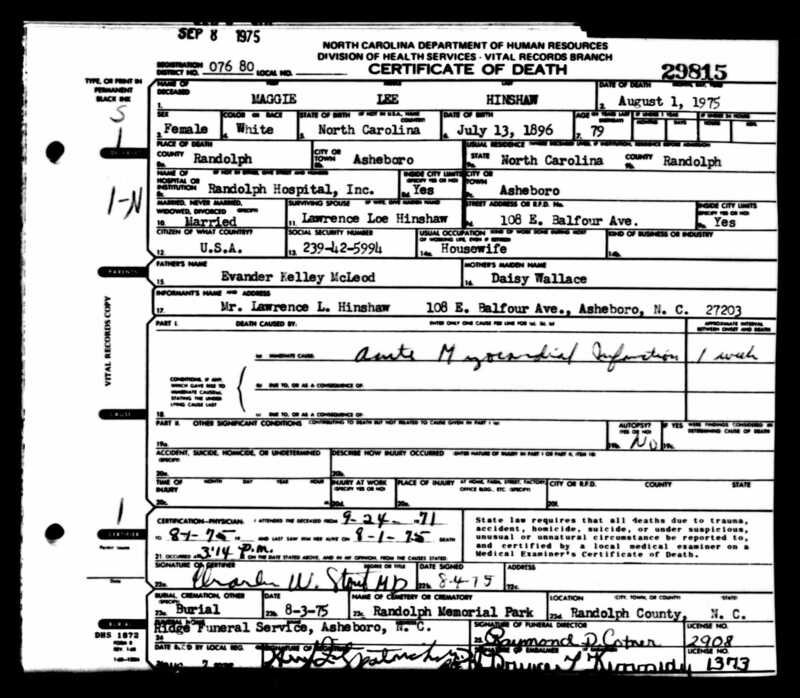 David Holt Hinshaw death certificate. Contribution from Kay Hinshaw Powell. 1900 census, Franklinville Township, Randolph County, North Carolina; ED 87, page 120A, line #23, dwelling #147, family #154. 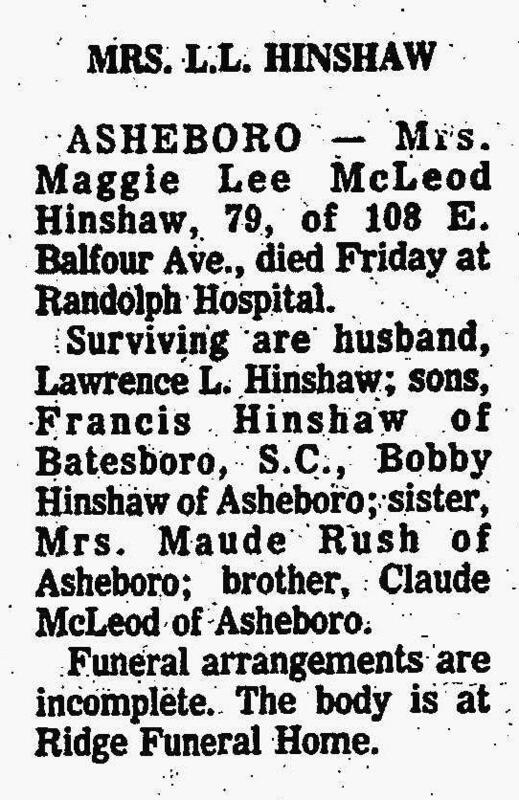 Obituary of Maggie Lee McLeod Hinshaw; "The High Point Enterprise", Aug 2 1975; http://www.ancestry.com.